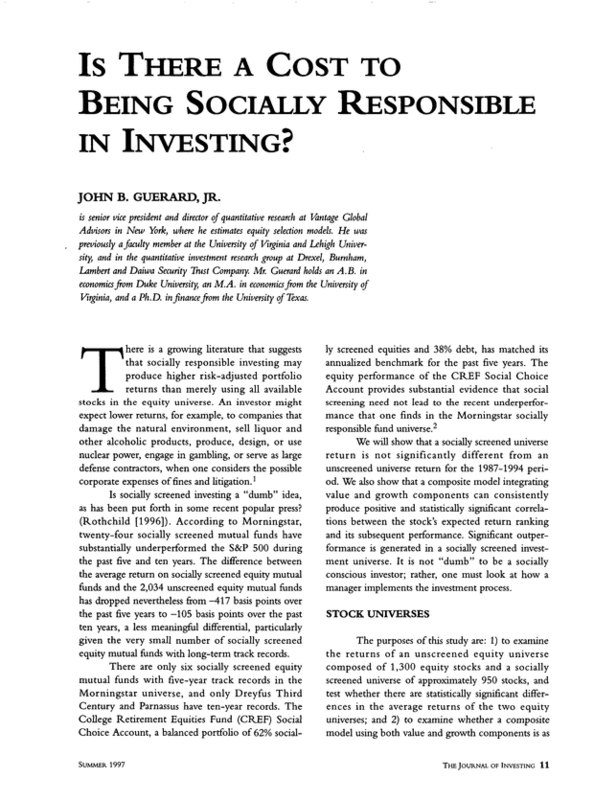 Is There a Cost to Being Socially Responsible in Investing? Senior vice president and director of quantitative research at Vantage Global Advisors in New York, where he estimates equity selection models. He was previously a faculty member at the University of Virginia and Lehigh University, and in the quantitative investment research group at Drexel, Burnham, Lambert and Daiwa Security Trust Company. Mr. Guerard holds an A.B. in economics from Duke University, an M.A. in economics from the University of Virginia, and a Ph.D. in finance from the University of Texas. You are going to email the following Is There a Cost to Being Socially Responsible in Investing? In Defense of Evidence-Based Wealth Management: Wheres the Beef? Do Mutual Funds Marketed to African American Investors Extract Excess Rent?